“Drug addiction affects the frum community. We don’t want to acknowledge it but it is real. It is there”. A former drug addict and alcoholic, YISROEL*, implores the community to listen to his message. “I have been there and now I am raising my beautiful family. I want people to know that drugs and alcohol are real issues and affect kids and adults from all families. Even the best, nicest, ‘big name’ frum families”. Yisroel came from as normal a family as any other. “We were a frum, non-pressuring, and typical chassidish family. I was a normal yeshiva bochur, went to the right schools and was a good kid”. His journey with drugs started with a medical diagnosis and was prescribed opioid pain medication post-surgery. “It started off for pain. I used it just as prescribed. But then I kept searching and asking for more”. When his doctor stopped prescribing them for him, Yisroel found a friend to give him drugs until that supply ran out. “I was miserable. I was able to still buy alcohol but without the opioids I was depressed and lost”. After a while, Yisroel got engaged. “I felt like I didn’t need the medication anymore. I was feeling great!” Until the wedding day, that is. On his wedding day, Yisroel relapsed. “I didn’t know that the drugs were a problem. I saw it as a medication problem, not a drug issue. Now I know better. I am an addict”. Yisroel started raiding cabinets for painkillers, ruined his marriage and “my life was a mess. My wife was pregnant with twins and while it should have been the happiest time of my life it was the worst as I had no pills”. Yisroel then tried Suboxone, a medication-assisted treatment protocol to stop using opioids. “I then became addicted to the Suboxone and it was worse. If you can imagine- it was even more difficult to stop using Suboxone”. Yisroel’s quality of life continued to decline. He could not work, his marriage was in a tragic state, he was depressed and he could barely leave the house. His wife met someone who had previously gone through the Chabad Treatment Program. This angel helped Yisroel come to the Chabad Treatment program. “While the detoxing from the Suboxone was worse than Gehenom, after being in the program I realized what an inspiring place it was. The staff cared. I was clean. But the worst part? What I finally saw as the terrible effects of my addiction. My kids came to visit me when they were 18 months old and that was the first time I really remembered being with them. I mean truly with them. I was clean for the first time since they were born. I regret that I lost that time with them but after treatment I was in a better place and a better person”. Yisroel graduated the program and returned home to his family. After some time being home, Yisroel said he stopped actively working on the Recovery Program. He stopped going to AA 12 Step meetings (which he and other former addicts say are crucial for continued sobriety) and had other stresses in his life including some marriage issues and work difficulties. “I had increased responsibilities which was nice as there was a salary raise involved. But the pressure got to me”. Yisroel then relapsed, causing more strain upon the family until his wife threw him out. Soon after, he happened to go to a wedding of a friend from Chabad where Chabad Treatment Center’s House Manager, Benny, was present. Yisroel asked Benny to be allowed to return as he realized how terrible drugs were for his life and what he needed to do to be sober. That night Benny made a call to Los Angeles and Yisroel booked his ticket the next day for Chabad Treatment Center. Benny says afterward that “I wanted to help him so much. He’s a good guy who just needed our help”. Yisroel made a tremendous amount of progress at Chabad and is now at home, living with his family and has been sober since. “I don’t know where I would be without Chabad. If not for Chabad I would likely be dead”. Yisroel shares that he values life more and tries to really be there for his wife and precious children. He shares that those in recovery treasure every day, every moment and every smile from their family more than anyone else he knows. When I ask Yisroel if he still in touch with anyone in the Chabad Treatment Center he tells me, “I still text Benny every Erev Shabbos. I want him to know that the work he is doing is worth it. When I was there I saw his phone beep. ‘Those are my babies texting me’ he responded. He really cares about each and every guy who comes through.” Chabad is a family. *Name and identifying details have been changed to protect privacy. This interview was given with the client’s blessing to share his story so that the rest of the Jewish community can benefit. 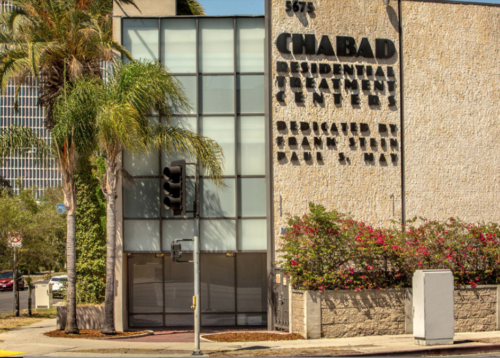 However, Chabad Treatment Center’s mission includes protecting the privacy and confidentiality of those involved even long after the client has graduated. There are many Yisroels, Yaakovs, Avis and Dovids in our community. Chabad Residential Treatment Center is here to help. Many participants like Yisroel come to the Chabad Residential Treatment Center who have no resources and we rely on contributions from the community. Please help support Chabad Treatment Center so we never have to turn anyone away who is need of our help. Please donate now. For more information or for an intake, please contact Chabad Residential Treatment Center at 323-965-1365. All inquiries will be kept in the strictest confidence.